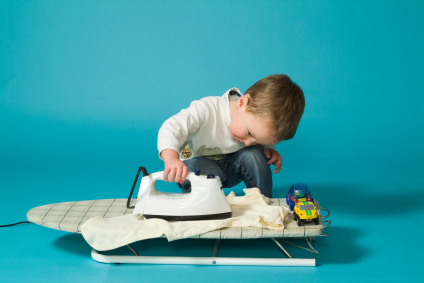 Ask A Speecie – When do children usually start doing pretend play and why is it important? When do children usually start doing pretend play and why is it important? Pretend play may also be known as creative play, imaginative play or make believe play. Children typically begin to demonstrate pretend play actions when they are approximately 17 – 19 months of age. When children start to use pretend play, they use themes relating to their everyday activities or what they see adults do. This may include pretending to talk on the phone, using a real brush to brush Mummy’s hair, pretending to eat or pretending to sleep. You may see your child using pretend food to feed themselves or others, including their toys. From 2 years of age, children typically start to represent themes from outside of the home, for example going shopping. They then start to represent less experienced life events, for example doctor’s play, at 30 – 35 months, and never experienced life events, for example being a fireman rescuing people, at 36 months. As children’s play progresses, they start to sequence their play stories and steps in logical sequences. Pre-planned story lines in play, for example saying “let’s play shops” to one another and pretending to open a shop with customers, also begin to emerge from 4 years of age. Pretend play develops along with language skills, cognitive skills and social skills. The ability to use pretend play is an important skill for children to engage socially with each other. By participating in pretend play, children are given the opportunity to develop and practise their social skills and language skills. Things may not go to plan in play and children may not always have their desired role or toy. These situations provide opportunities for children to develop problem solving, negotiating and self regulation skills. As play develops, children also practise using their planning and organisation skills. For example, when acting out a pirate story, children may plan what role each child is playing, what toys they will require and what the story line will be. Play is also an opportunity for children to practise their motor skills and explore the use of different materials and sensory experiences. If you would like to find out more about your child’s play please contact the team at reception and ask to speak to a Speech Pathologist.